Sarah Brown, Samantha Cameron, Michelle Obama, hell even Miriam Clegg. Powerful ladies who have pulled priministers and presidents. No doubt it must be tough being the wife of important men like their husbands. Having power in politics as they do, or if not power then simply the reputation of your hubby being Gordon Brown/David Cameron/Nick Clegg/Barack Obama, they often get swept under the politics carpet. I mean they aren’t snapped at the front rows of London Fashion Week. We rarely see them in ‘This Weeks Best Dressed’ columns. A recent article in Elle UK suggested women can’t have power and glamour, without great difficulty at least. 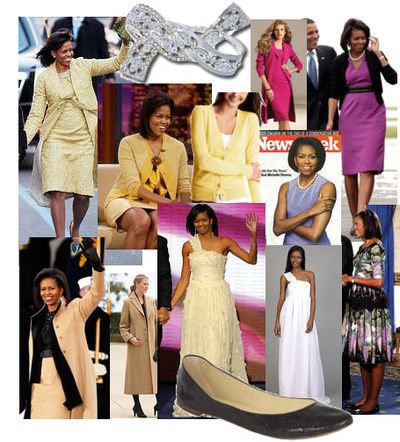 However, if you look closely, remarkably, these powerful women are very fashionable. Sarah Brown does her electioneering in fairtrade clothing, especially the ethical clothing brand People Tree. And although you may not have seen her, she did wear the brand to London Fashion Week. Even more remarkably, Brown appeared at the Elle Style Awards and aided Naomi Campbell in her Fashion For Relief Appeal! Sam Cameron is often pictured mixing high street (Reiss, Zara, Marks & Spencer) with designer (Erdem, Phillip Lim). Risque, high-fashion pictures of her have recently been released, her sporting sheepskin, shift dresses, and elegant evening gowns. Cameron has real potential in the fashion industry. It’s only natural that powerful political wives of the UK should step up their game, what with Michelle Obama bravely leading the way in her classic looks and elegant demeanour. Mrs O can be seen wearing newer designers like Peter Soronen, Than and Maria Pinto, along with classic pieces of Alexander McQueen, Narciso Rodriguez and Chanel.